At encouragement from a friend, we’ve done it. 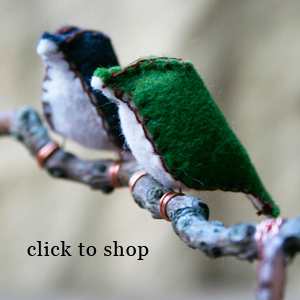 We’ve adventured beyond our comfort zone and…shhhh!…employed our little birds in the elves’ holiday assembly line. Just kidding! We respect their trade union contract. They’re actually the superstars of our new twig ornaments and tree toppers! Hope you like them! (And their lawyers don’t mind.) What? It’s Friday evening and I’ve been staring at felt for a long time. I’m allowed to get goofy, right? For real, though, we hope you like them! This entry was posted in Etsy Wondrousness and tagged bird, christmas, etsy, felt, handmade, holiday, ornament, rustic, star, topper, tree, twig. Bookmark the permalink.